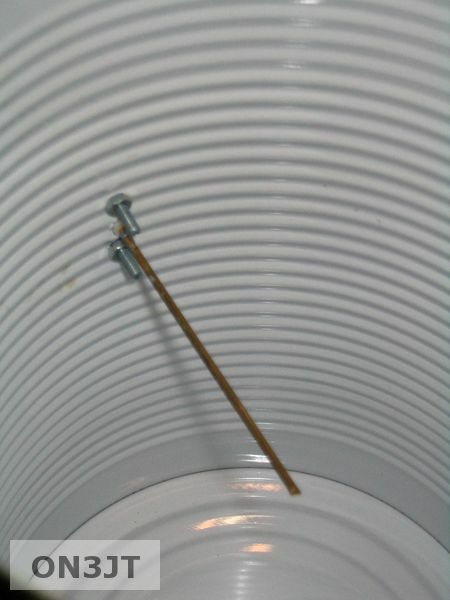 A cantenna is a directional waveguide antenna for long-range Wi-Fi used to increase the range of (or snoop on) a wireless network. 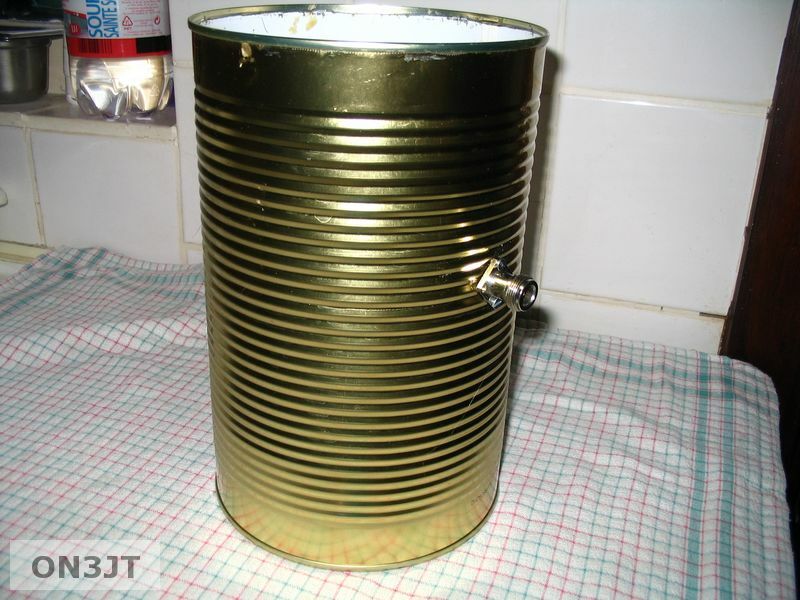 Although the original design was based on a Pringles potato chip can, a cantenna can be made from various cans/bottles. These include antennas on both the ground and antennas heightened by means of a pole. While cantennas are useful for extending a wireless local area network (WLAN), the tiny design makes them ideal for mobile applications such as wardriving. 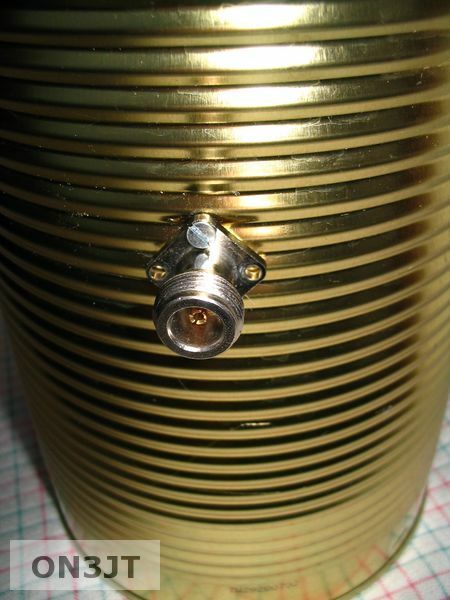 The design of the cantenna is so simple that it is often the first antenna WiFi experimenters learn to build. While visiting my parents around Easter I noticed a pretty large can waiting to be recycled. The diameter is 150mm and the height is 240mm. Hmm a cantenna was the first idea that crossed my mind. These wifi antennas operate on 2,4 GHz. The diameter seems too large. Next idea : a 23cm antenna for receiving the ATV repeater of Antwerp ON0MTV. I had an N-connector lying around with a small brass tube soldered on it to act as the radiating element. A cantenna has two cuttoff frequencies, your working frequency has to be between those two. I used http://www.turnpoint.net/wireless/cantennahowto.html to calculate them. The result : lower cuttoff = 1172.42 MHz, higher cuttoff = 1531.33 MHz. ON0MTV uses 1255 MHz for its output. Perfect. And here I made a mistake. I inputed the frequency and diameter. The Lg/4 dimension is 167 mm, but for some odd reason I took the prefilled in dimensions where Lg/4 is 140 mm. So I drilled the hole for the connector at the wrong distance from the back. Anyway, first test it and then correct it if needed. BTW the height of the can is probably also too low. According to the calculations it should be 501 mm instead of 240 mm. 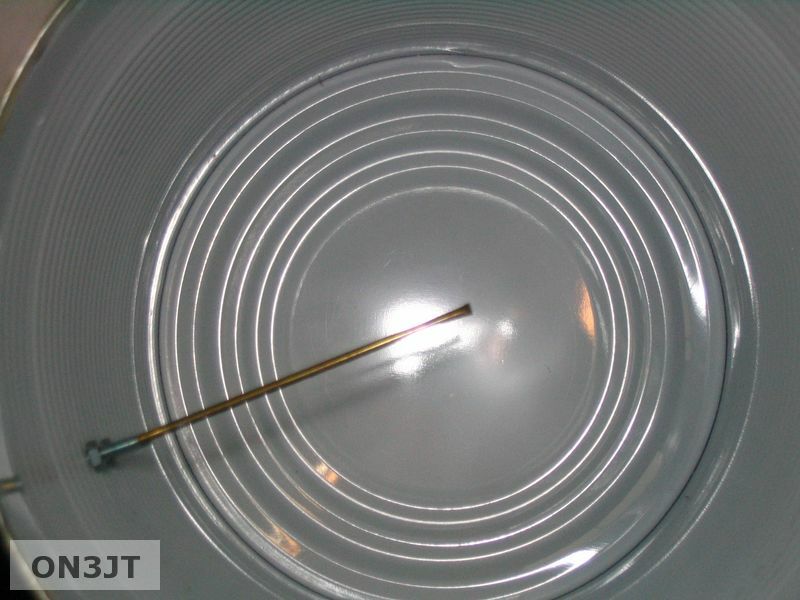 This entry was posted on Monday, March 24th, 2008 at 11:13 and is filed under Antennas, Projects. You can follow any responses to this entry through the RSS 2.0 feed. Responses are currently closed, but you can trackback from your own site.